Last fall, Sarah Godshall Hunsberger, one of our members in Harrisonburg, Virginia, called to say that she had some old family papers and artifacts to give to us, but wanted to send them with someone from the Souderton area who might be traveling to the Harrisonburg area and back. Eventually, through the Mennonite “network”, an old wooden box labeled “Keystone Watch Case Company” showed up at the front desk here at the Mennonite Heritage Center. It was half filled with various old papers, books, and a few photos from Sarah’s family. When I was finally able to sort through the box, several days later, I was surprised with what I found. Box labeled “Keystone Watch Case Company”, perhaps late 19th century, from the former Gehman watch and clock repair shop, Bally, PA. This box held the Gehman and Histand family papers. Stacked in the box was a fairly small collection of papers, account books and photos from Sarah Godshall Hunsberger’s mother’s side, the Histand and Gehman families of Doylestown Township, Bucks County and Bally, Berks County. The oldest signed documents were an 1831 school ciphering book and two record books with entries dated 1836 to 1860, used by Joshua Histand (1817-1866), or Hiestand, of Milford Township and Doylestown Township, Bucks County. The second page records sales which seem to be from 1846, although no year is given on this page. Here are examples of the farm products Histand sold between April and July that year: a bull skin, one calf ($3.87), one cow ($22.50), 11½ dozen eggs, 14½ dozen eggs, 13½ dozen eggs, 10 dozen eggs; 33 pounds, 50 pounds, 43 pounds, 60 pounds, and 70 pounds of butter; a bushel of “potaters”, another cow (at $5.50 a hundred-weight), 2½ bushel of potatoes, 19 bushels of field corn, 15 bushels of oats, and another calf. Later in the year, he had many sales of butter and eggs. Joshua Histand (1817-1866) was the son of Jacob Hiestand (1791-1877) and Barbara Swartz Hiestand of Allen Township, Northampton County (near the village of Seemsville), and members of the former “Settlement” Mennonite congregation there. In 1832, when Joshua was about 15 years old, his family moved to Milford Township, Bucks County and bought a farm near what was later the village of Rosedale. His father Jacob was ordained a preacher in the Swamp congregation soon after this move. Ten years later, in 1842, the family moved again; this time to Doylestown Township, Bucks County, and bought a farm along what is now Shady Retreat Road, just outside of Doylestown. I have to wonder if the growing tensions in the Swamp Mennonite congregation in these years was one of the factors in this move. In 1847, a significant church division occurred in the local and broader Mennonite community, and John H. Oberholtzer, the main leader of the progressive faction, had been ordained a preacher at Swamp in 1842. 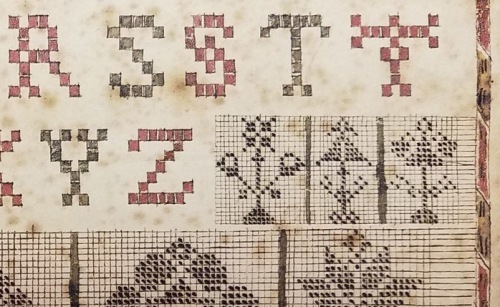 A couple days after we received this donation, I discovered hidden inside the 1831 ciphering book a rare and most unusual manuscript – a drawing on paper of sampler patterns, dated 1812! Unfortunately, this document has no name on it, but it likely came from a previous generation of the Histand family. It’s a neat, delicate drawing with upper-case letters of the alphabet at the top and fine embroidery patterns that could be cross-stitched on a girl’s sampler. I believe the drawing was done by a young woman, perhaps Joshua’s mother Barbara Swartz, before she was married. Drawing of sampler patterns, dated 1812, but unsigned; found in Joshua Histand’s ciphering book. Two other interesting documents from this family were already in the Mennonite Heritage Center collection – an 1842 auction advertisement for Jacob Hiestand (Joshua’s father) and an 1835 birth and baptismal certificate for Anna Hiestand, sister of Joshua. Joshua Histand moved with his parents Jacob and Barbara to near Doylestown, Bucks County in 1842, where they became members of the Doylestown Mennonite congregation. According to his own records, it appears he was farming on his own in a few years – 1846 was a year of significant purchases of livestock, farm equipment and household furnishings, as well as his first year of selling farm products. Early in 1851, Joshua married Catharine Myers (1826-1851), who died just one week after their only child Catharine was born, in December 1851. In March 1853, he married Mary Hunsberger (1822-1895), daughter of Bishop Henry and Catharine Derstine Hunsberger of Hilltown Township, Bucks County. They had three children together: Isaac (died in early childhood), Barbara, who married William Good of Vincent, Chester County; and Sarah, who married Enos S. Gehman of Bally, Berks County. Joshua’s farm was along what is now Shady Retreat Road, in Doylestown Township, close to his father’s farm and mill on Cook’s Run, a tributary of the Neshaminy Creek. Nothing is left of these farms or the mill today. Jacob and Barbara Hiestand, as well as Joshua and his two wives are buried in the Doylestown Mennonite Cemetery. Joshua and Mary Histand’s daughter Sarah Histand (1859-1938) grew up in Doylestown Township, and married Enos S. Gehman (1855-1918), son of John L. & Elizabeth Stauffer Gehman, of near Bally, Berks County and a member of the Bally (Old) Mennonite congregation. Enos and Sarah lived in or near Bally, where he became a jeweler and had a clock and watch repair shop. 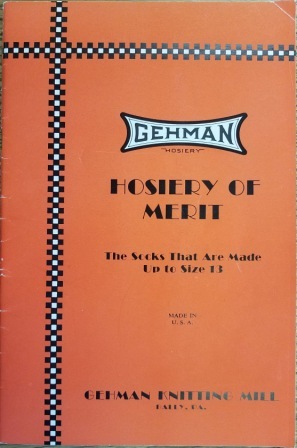 He was ordained a deacon in the Bally congregation in 1906, and in 1914 started a hosiery mill in Bally, known as Gehman Knitting Mill, which provided employment for several of his children. Son Jacob H. Gehman eventually took ownership of the mill; son David worked as a machinist, and daughters Bertha, Lizzie and Amy Gehman worked there in various roles. Sons Harvey and Eli Gehman took over the clock and watch repair shop, and became opticians. Daughter Clara and son David worked there as well. The Joshua Histand record books were passed on to the Gehman family; they saved some of their family records and papers, which were added to the collection and passed on to their youngest daughter, Elsie H. Gehman (1902-1985) who married Abraham A. Godshall. Their daughter, Sarah Godshall Hunsberger, donated the collection to the Heritage Center. We’ll show just a sampling of the Gehman family papers. The Enos and Sarah Gehman family papers make a nice addition to the larger collection of papers and records from the John Z. & John L. Gehman family of the Bally area (Hist. Mss. 49), which were donated to the Mennonite Heritage Center years ago. A cow is a very useful animal for the farmer, for she gives milk, from which we can make butter, and also cheese. A pound of butter is worth from fifty to sixty cents. The cow has four legs, two ears, two eyes, and a long tail, for chasing the flies. In summer we drive them in the field, where they eat grass; … A good cow is worth from seventy-five to one hundred dollars. A late 19th century advertisement for farm equipment, found in the Gehman papers. Auction broadside, 1923, for the property of “Mrs. E. S. Gehman” (Sarah Histand Gehman), in Bally. Her husband Enos had died several years earlier, and now she was disposing of farm equipment and household furnishings. Brothers Eli and Harvey H. Gehman ran the watch & clock repair, and optician shop in the early 20th century. This is to inform the Brethren and sisters of the above mentioned congregation that Brother and sister Pre. John Kriebel have fallen into debt financially and are unable to pay their outstanding debts. They have asked a few members for help, and after holding council it was decided to give an invitation to each member to give a free-will offering, and give as a donation what falls, so that they can pay their outstanding debts. Anything you feel like giving you can give to the undersigned Deacon Abraham Ehst, who will gratefully receive it and hand it over to the Brother and Sister, and if you do not feel like giving there shall be no ill feeling. “Bear ye one another’s burden and so fulfill the law of Christ.” Gal. 6:2. 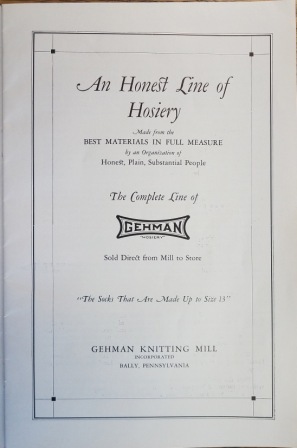 Catalog from Gehman Knitting Mill, Bally, Pa., from about 1930. Begun in 1914, hosiery mill employed two or three generations of the Gehman family as well as others from the Bally community. Ruth Histand Mosemann, Family Directory of Samuel Swartz Histand and Susan Overholt Landis (Descendants and Ascendants). (Nappanee, IN, 1969), 54-58. “History of Gehman Family”, unpublished, undated typescript compiled from the research notes of the late Mary L. Bower, Mennonite genealogist, Boyertown, PA. Mennonite Heritage Center Collection. George S. Hunsberger, The Hunsbergers: A portion of the Genealogical History… (Germantown, NY, 1969), 556; 560-563. John C. Wenger, History of the Mennonites of the Franconia Conference (Telford, PA, 1937), 263. W. E. Morris, Map of Bucks County, Pennsylvania (Philadelphia, 1850). J. D. Scott, Combination Atlas Map of Bucks County, Pennsylvania (Philadelphia, 1876), 30. Wonderful information Joel, and great images thank you so much. Such fascinating details of life two centuries ago. It’s great how you are able to fit together so many family connections within the archives. Brethren in Christ Hist. Soc.